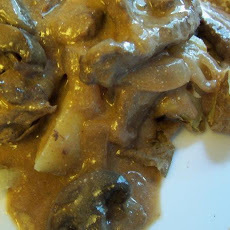 I love beef stroganoff, but I don't like spending hours making it. Here is an easy version I created that you can make in your crock pot. It is especially great in the winter when the days are cold. I make it alot during the week because I can throw everything in the crock pot in the morning before leaving for work and dinner is ready when I get home. All I have to do is steam the broccoli if I didn't add it in the morning. I am not a measurer and cook by feel. Crock pots make just throwing what you have on hand easy. 1. Brown beef and 1 large diced onion in butter or olive oil (in a rush, skip this step). Dump into crock pot. 2. While beef and onions brown, cook rice or noodles, save and reheat or do this step right before dinner. To make less clean up (1 les pan), instead of rice or noodles add chopped potatoes to your crock pot. 3. Wash mushrooms, slice in half. Place in crop pot. 4. Either whip up a white sauce or use 1-2 cans cream of mushroom soup. (you can get an organic cream of mushroom soup at Whole Foods which is pretty good). The steam and juices from your meat and veggies will thin the sauce. 5. Choose to dump broccoli into crop pot now (it will turn a canned green bean shade of green if you do this) or boil or sautee it right before serving dinner and add to meal. 6. I cook on low about 5 hours. On high, it takes about 3. 7. Top or add sour cream. *Add salt and pepper to taste.